The pattern of movement of small children develops gradually and learning to crawl is a natural stage in this process. Children learn and perceive their surroundings through the body and its senses. The physical activity of the child helps to make it secure in its own body and therefore it is important that the child is helped and motivated to start crawling – Meyland Discover® supports the child in this development. The child is helped into Meyland Discover® and placed with the sling support under the chest/stomach. The child is now supported and held up so it becomes easier to start crawling. 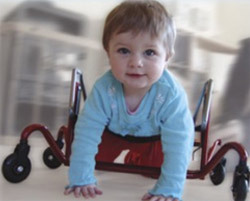 Meyland Discover® arouses the child to start crawling and the musculature of the arms and legs is thereby strengthened. This is a help to the child in several situations and furthermore it helps to promote the development of the child's motor skills.